The USS Wasp, carrying at least 10 F-35Bs, is participating in a joint military exercise with Australia and the Philippines. 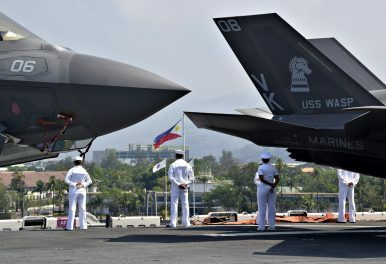 The Wasp-class amphibious assault ship USS Wasp (LHD 1), carrying at least 10 F-35B fighters, the U.S. Marine Corps’ short take-off and vertical landing (STOVL) variant of the supersonic fifth-generation F-35B Lightning II Joint Strike Fighter, arrived in Subic Bay, the Philippines on March 30 in preparation for a joint military exercise with Australian and Philippine forces. The so-called Balikatan exercise is the largest military exercise between the United States and Philippines. This year’s iteration of Balikatan, like in the preceding year, features participation from Australia. It will be the first bilateral military exercise to incorporate the USS Wasp with the embarked F-35B Lightning II aircraft. “During Balikatan 2019, U.S. and Philippine forces will conduct amphibious operations, live-fire training, urban operations, aviation operations, and counterterrorism response,” the U.S. Navy said in a statement. “All events will take place in Luzon and Palawan.” The military drill aims to boost interoperability between the navies and will principally focus on maritime security and amphibious capabilities. The USS Wasp is the size of a small aircraft carrier and can carry around 31 military aircraft including AV-8B Harrier IIs, MH-60S Knighthawk helicopters, AH-1Z Viper helicopters, and MV-22 Osprey tiltrotor aircraft. The amphibious assault ship, commissioned in 1989, has a crew of over 1,000 officers and sailors and can embark around 2,200 Marines. In 2017, the Wasp was retrofitted to be able to accommodate the F-35B. As part of the overhaul, the ship was also equipped with a new combat system and upgrades to the MK 2 Ship Self Defense System, SPQ-9B horizon search radar, and MK 57 NATO Sea Sparrow Missile System. The F-35B conducted its first close air support strike in Afghanistan in September 2018. The lead ship of the U.S. Navy’s newest class of amphibious assault ships, the 45,000-ton USS America, designated Landing Helicopter Assault (LHA) 6, will deploy to Japan by May of this year and replace the USS Wasp as the biggest forward-deployed big deck in the U.S. Navy’s 7th Fleet. The USS Wasp replaced its sister ship USS Bonhomme Richard as the flagship of Task Force 76, which includes all of the 7th Fleet amphibious forces, in Sasebo, Japan in early 2018. In a first, U.S. F-35Bs dropped guided bombs on practice targets during a military exercise at sea in Asia this week.